We’ve all heard the names. The names of those who’ve made this community great are plentiful, but there are quite a few other names that we may not hear about day in and day out in the world of UFOP. New recruits, academy graduates and newly commisioned officers are the rising stars that will continue to help the community grow in so many ways. In this column, we’re going to explore some of those names; from the writer all the way down to the character, in order to give you a feel for what the future of the UFOP community may hold. In this edition, we’ll delve into the life of a curious young scientist aboard Starbase 118 in the Operations section: Ensign Harold Foster. Throughout the character building process, some writers may find that there is an inevitable crossover between themselves and the character they’re forging. We try to avoid this for a few reason, first and foremost being that there should be a definite distinction between what is real, and what is simply fiction designed for pleasure. Other times we seperate ourselves so that the creative process can flow uninhibited by any other outside forces. on the contrary, some of us are perfectly fine with giving a bit of ourselves to our characters, so long as that crossover doesn’t become a problem. The writer for Mr. Foster, one Mr. Dziugas Parsonis or “D” as he often signs his OOC posts, decided to tackle this epic decision head on by creating a character that was totally different from that of himself. “Harold Foster is very different from myself both physically (age, build, hair, eyes – everything) and emotionally. Foster is a more reserved fellow, while I am very outgoing. Foster is thoughful, and I am impulsive etc. So I guess, yes, I was sort of creating an opposite of me.” Additionally, D threw in the fact that making a character that was opposite him was something he had in mind right from the start by saying, “Foster is not my ideal – not by a long shot. I’m quite happy the way I am. I just thought that simming somebody very different from myself would be a great experience.” Clearly as writers we can see where that could be a challenging and fulfilling experience. But what challenges lie ahead for our Ensign? D finished his commentary on Ensign Foster by saying, “Despite our differences, Foster and I could be soulmates. I am a technology and science enthusiast (Harold Foster is a Science Officer); I like science fiction very much and have dreamt about space travel and undiscovered worlds since early childhood. We both judge people by their merits only and value honesty and true friendship. I am not as good as my character in hacking hardware and building home-brewed science projects, but I am fascinated by the things we could build ourselves. And we both are workaholics…” All in all there seems to be a clear and working relationship between Mr. Parsonis and his character, one that has been more than beneficial to his current crew. 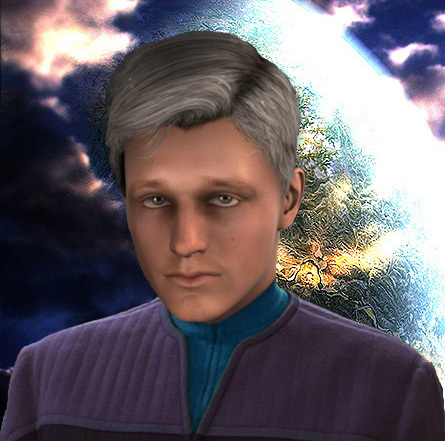 Ensign Foster is currently assigned to Starbase 118. When asked about his crew’s current mission, he retorted with a rather enlightening response. “Yes, well… I am astonished what our commanding officers let us run with it! On the very first day, after graduating from the Academy, my character got an assignment to check the ship’s sensor arrays. He found them to be faulty, of course (causing dismay for officers responsible for the ship’s operations I’m afraid). That routine job eventually developed into a sub-plot, and again into a full mission that our team is on now. I did the concept for the mission – an accomplishment I am unashamedly proud of.” And as an Ensign, and a writer to who English is a second language, this is certainly a wonderous accomplishment in the eyes of other junior writers looking for greatness. A rising star in the world of UFOP indeed, but what else is next for the young ensign? Surely his commanding officer can atest to the diligence of her Ensign, eh Commander Nicholotti? [Says jokingly] “I hope to make Foster’s life miserable. He is an honest, unassuming and hardworking science officer who hopes to one day have his own science lab and devote himself to scientific study. But I’ll try very hard to interfere and test his loyalty, courage, capacity for love and sacrifice as well as his ability to lead people – all the things he hopes to avoid. We’ll see what develops. Though to be honest, I would like to see Foster at the very center of the bridge some day…” A lofty, yet noteworthy goal for someone who’s just starting on his path into the unknown. I find the comments in this last section from D to be quite centering. He describes a role as the writer to be one of goal setting and creating challenges for his character. This concept in itself seems to be a great way to look at things in the simming world. It seems to be a constant see-saw relationship between writer and character that makes this whole thing work, and also makes it fun in the process. The young Science Officer seems to be making his own way in the Federation, and his writer seems to be challenging himself with every post. This already sounds like the making of a great CO. Will Starfleet give him a shot? Will Foster achieve all the things he’s set out to do? Will Mr. Parsonis continue to challenge himself differently each day and learn a little more about himself? These are all questions that we as the audience may see the answers to in the near future. A rising star among others. Hopefully here we can see that even in the Lower Decks, greatness is always cultivating new talent to enrich our strong-running community.